Blogging or running a site is useless if you are not converting your visitors into returning visitors or customers. A blog’s reader or an ecommerce's site customers can be engaged more using a user friendly subscription form that may blend perfectly to your site layout. Generating new leads is not an easy task. If you are in legal business, you would do this via a subscription form. Building a clean email list is all you need to run a productive email marketing strategy for consistent flow of income from recurring customers. One such platform that I have personally enjoyed using is SendPulse Email which allows you to create a subscription form in a new form builder in extremely easy way with drag and drop utilities. 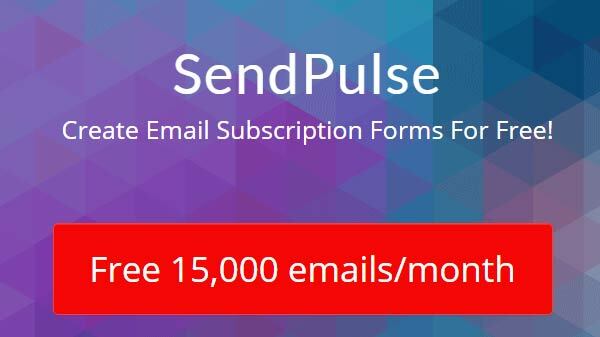 I recommend SendPulse to most of my readers and clients because If you have less than 2,500 subscribers you can send up to 15,000 emails per month for free using SendPulse. If you don’t want to create a subscription form wholly on your own, you can choose one of the 10 already existing templates and edit it to your liking. In spite of being a ready template, you can make your form original and creative, using different elements and design. You choose the type of a subscription form. There are 4 variants. Embedded: You can paste the code in any fixed location on your site. What is available in form builder? Double opt-in is included in subscription forms, it means that users are fully aware of what they subscribe to. Firstly, they fill a subscription form, then, receive a notification to confirm a desire to subscribe, following the link. There are 2 types of notifications in SendPulse. Edit it as you wish at the last stage of creating a subscription form. Use these fields to collect the necessary personal information about the users, such as name, email, phone number, etc. Don’t forget to create the corresponding variable. Thus, a new column in your mailing list will occur. With the help of this element, you can gather more useful information about the users to use it for segmentation. This is a useful element, when you want to find out the users’ age, for example. You just specify the text of the options and add a variable. You can write any text you want, don’t write just “Subscribe”. Be creative! Images make subscription forms original and creative. Make use of them! Available size – 1 MB. You can apply any design you want to any of above mentioned elements. Change fields direction, width, form background, form border, round corners, font, inner padding, fields’ size, alignment, labels position. After having created the form, you will receive code, just add it to your website. So, the form builder is pretty easy in usage and allows to create original and beautiful subscription forms in couple of minutes. ALSO READ: Why Build Email List? Need Help Setting Up SendPulse?